I thought I'd start out my brand new blog with one of my classic and favorite writings. This was one of the very first blogs I ever wrote, and I think it's appropriate for here. Cemetery: the very word can strike fear and awe in those who have ever had any experience or dealings with them. Anyone who has ever visited a cemetery generally leaves feeling one, or both, of these emotions. Cemetery is from the Greek etymology, koimEtErion which literally means sleeping chamber or burial place. Cemeteries are often considered places of peace; it has always been conveyed that they are places of rest and serenity. Cemetery and Memorial Park owners, doyens, and founders have almost always expressed this throughout the somewhat recent history of their existence. But it seems that we, as a society, have started to discredit the need and purpose of cemeteries. See, they aren’t just places of rest for the dead - they are stepping stones into our past. Many people ask me how I became interested in a career such as funeral service at such an early age. My response is always the same: Cemeteries. One summer, my step-mom was researching family history for membership in the Daughters of the Republic of Texas and we literally spent the entire summer traveling the state of Texas going through cemeteries. Obviously, that had an impact on me. But even before that, my grandfather used to take me to our family’s graves, and I very vividly remember seeing my great grandmother’s stone, and reading the words “Ruhe in Frieden” – German for “Rest in Peace.” I remember as he told me stories of family members whose graves we were visiting, and where they fit in our family history. It was there that I first learned of my family – who they were, what they did to thrive and, ultimately, where I came from. These stones I saw were more than just places of record for future generations, they were almost like portals into the past – windows that opened up conversation and stirred the heart and sparked the memory. I was thinking just recently, while visiting with a family as they prearranged for the imminent death of a loved one, and explaining to them the benefits of these stepping stones – that although I am a major advocate of cremation, it is my opinion that there should always be a stepping stone of some sort. It is very important for these touchstones to be available for generations to come. Now, let me make myself a little clearer. 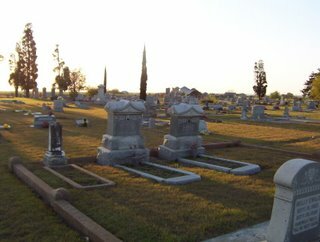 A final resting place can be a family plot, a columbarium niche, a mausoleum crypt – whatever is appropriate for a particular family, the result is always the same: Permanent Memorialization – touchstones that leave a physical legacy for future generations. Additionally, whether the final resting place is actually in a cemetery or if it’s a columbarium niche or a mausoleum crypt or whatever – even if a family chooses cremation, it is detrimental to the grieving process to have closure. Part of this closure is memorialization. Many times, there is a sort of closure for a family to see a loved one’s name and dates of birth and death permanently inscribed, carved into a block of granite. Even, and especially when a family chooses to scatter a loved one’s cremated remains, we should always encourage some type of permanent memorial – something tangible, something that they can touch and feel, not just emotionally and spiritually, but physically. This is a very important heritage that we must pass on to our future generations. Many stories and thoughts have been shared while visiting the Engler Family plot at San Geronimo Cemetery in Seguin, Texas. And even though it is my choice to be cremated, my cremated remains will one day rest there as well. Then, in years to come, my children, grandchildren, and all of my progeny will be afforded the opportunity to return there and honor my memory and pay homage to the legacy I’ve left.